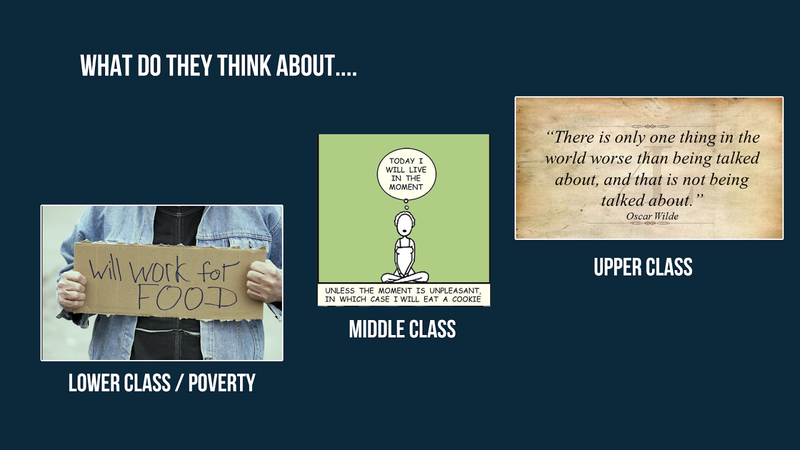 Claire, Ben, Tye, and Frank were fortunate to attend the Poverty workshop last week and the following blurbs below are the essential takeaways we all got from it. What questions can you ask yourself to guide your thinking and actions towards community sustainability? Fill in a question for each box that will illicit an action plan. Consider the demographics of our learners, hidden rules for socioeconomic levels and cultures, and resources. Lastly, don’t shy away from the EXPLOITATION box! Resources can be exploited for good. Remove the stigma from the word. Mahalo for taking the challenge to enact systemic change! What do you think various classes think about? The upper class think about their life's legacy, the middle class tend to think about their current life and the next generation. The lower class really think about the now...like if they will have food tonight to eat? One of the concepts that was introduced in the workshop was about hidden rules. We all know that hidden rules exist but we often take these things for granted. Knowledge and awareness of hidden rules provided me more insight and empathy for people who are experiencing poverty. Learning more about hidden rules will help us understand a person’s situation better instead of instantly judging and assuming things. This will help in building pilina and eventually gaining trust and respect. The real challenge is taking the first step: to build pilina with someone who is in poverty. Do not build pilina because you want to teach them, to fix them, to change them, to learn about them or to serve them. You are building pilina because you just want to be friends.